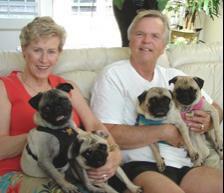 We want to introduce ourselves to everyone looking in on us and many other fortunate pugs who were blessed by God to be taken in, given medical care, loved a barrel full, and given new homes by the “Angels” at CPR. We are Henry (aka Tommy) and Maggie (aka Angel). We are both from Miami as we have been told. I (Henry) was found by Animal Control, dodging cars, unfriendly people, and just having an all around bad beginning to my short life. I was suffering from a very bad case of demodex mange, pretty skinny, and pretty afraid of people’s hands. But CPR came to my rescue. I was off to a wonderful foster home in Miami with my new foster Dad Ken who took great care of me. OK, Maggie it is your turn. I (Maggie) was also found by Animal Control, but I was in pretty bad shape for such a young girl. I had been hit by a car and had a right hip fracture, fractured pelvic bone, and a left femur fracture in three places. Needless to say, I was feeling pretty low and in a lot of pain. But the “Angels” at CPR came to my rescue. Over the next 4 months I had more surgery than I care to remember (performed by Dr. John Dee and the wonderful staff at Hollywood Animal Hospital) and was given soooo much loving care by my new foster Mommies Gail and Amy. We went through a lot together and I couldn’t have made it without their tender, loving support and care. Now come the best part. We are both now all healed from all our medical problems. And once again CPR came to our rescue and found us a loving home on the banks of the St. Lucie River in Stuart, FL. (We like to call it “The Pug Resort). P.S. We can’t thank the selfless volunteers at CPR for all their hard work. It is because of all your dedication that these 2 wonderful, loving pugs survived the terrible beginning of their lives and have filled our lives with such joy and love that we will never be able to repay them. May God Bless You All.